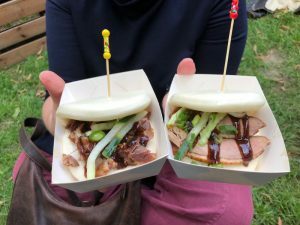 Last year, we went to the ‘Trek’(*) foodtruck festival in the city and had a great time (and great food)! This weekend is this year’s edition, and we invited babarage to come with us. We still had the (branded) hard plastic ‘glasses’ they use for the drinks over from last year, so we simply swapped our glasses for new ones when I went to get drinks. Good to know that those glasses carry over from year to year. We did a circuit of the grounds to take stock of what was on offer, and manage to score two little crates to sit on. We installed babarage there, and then we went on various foraging trips! 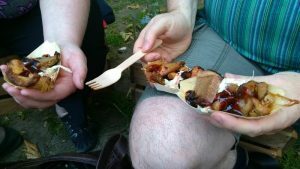 First course: I had a chorizo ‘hotdog’ (though much larger than a regular hotdog) which was delicious! The others had an asian tasting platter to share. For the second course, we shared a grilled steak sandwich with the three of us. 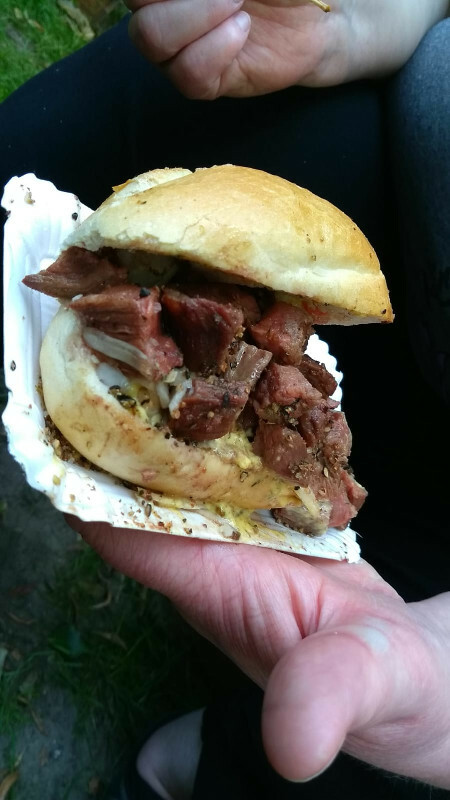 The people selling it warned me that someone with an allergy to nuts shouldn’t eat the sandwich, but babarage ate some of the steak pieces without any ill effect. 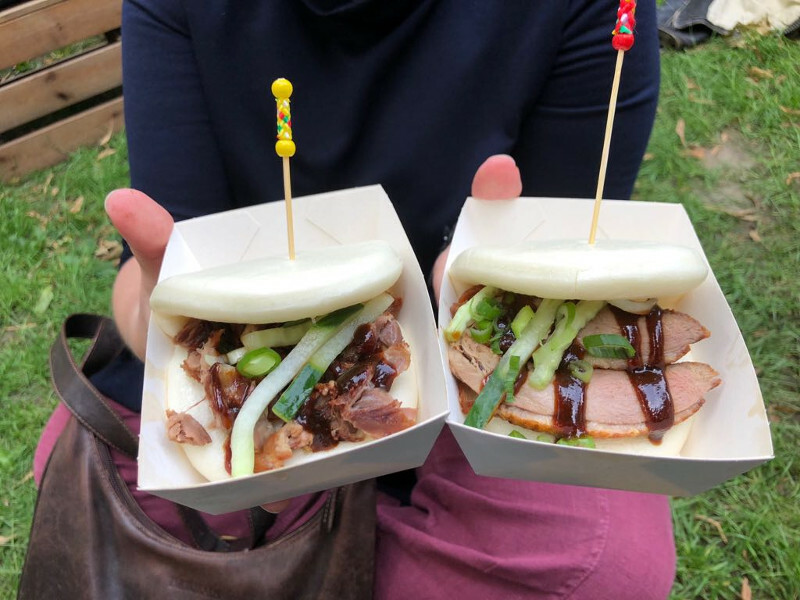 For the third course, we shared two steamed buns filled with grilled duck with hoisin sauce. Delicious! So much food, and there was more delicious stuff that I would want to try, but by the end we were quite done with eating! We’ll be sure to come back next year. 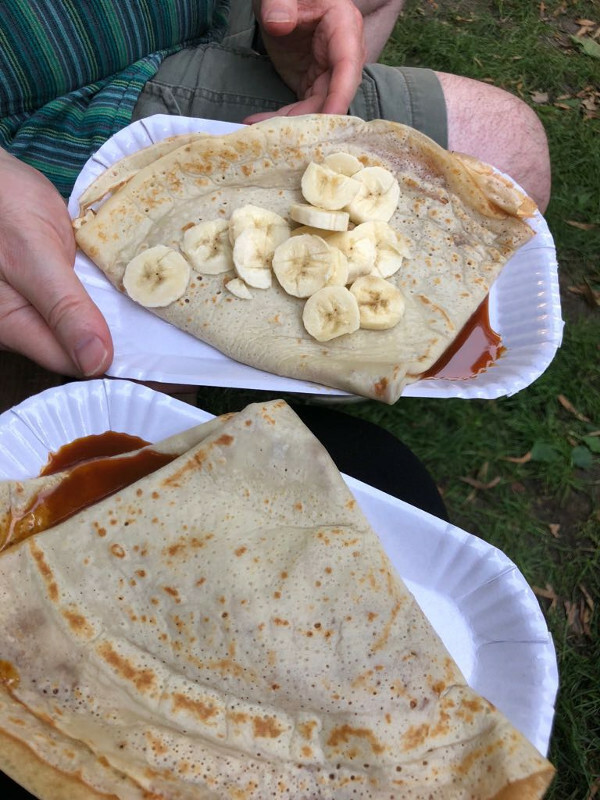 Yes, they were crepes. The guy making them was even French, so they're even authentic French crepes! Honestly, I don't get the obsession with nutella. Real chocolate is much better. It was very good! It was perfect: nice weather, good company, delicious food. 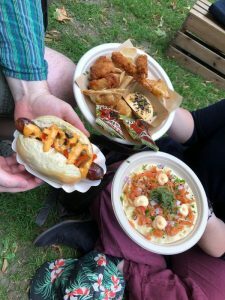 Food festivals are THE BEST!